In a year that saw the pollsters outwitted and the liberal elite confounded, at least Britain could rely on the fact that cute animals will always win the public vote. Adwatch of the Year charts the year’s 20 best-recalled TV brands, the ten most memorable individual ads and the ten best-liked commercials researched by Adwatch that launched between November 2015 and October 2016. 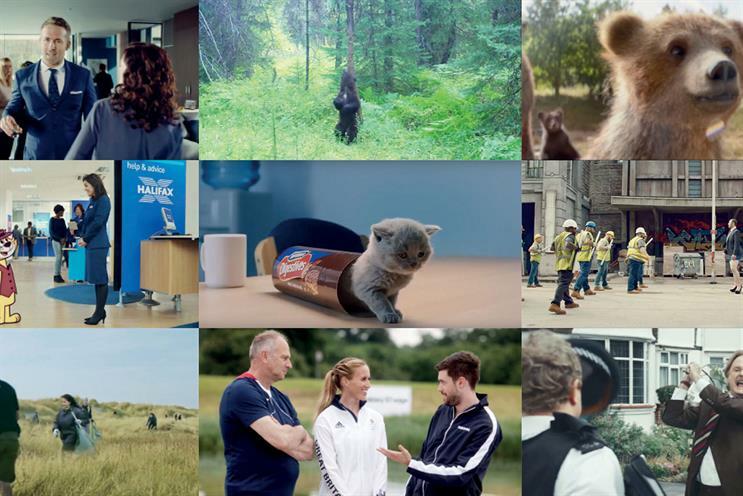 The best-loved commercial of the year is Grey London’s McVitie’s "Kittens", while Mother London’s "Epic squads" for Moneysupermarket.com scored 2016’s highest individual recall percentage. But the star of the show is DFS, whose work across the year was overwhelmingly the best-recalled TV advertising. DFS’s triumph is largely due to its highly visible Team GB sponsorship, which Krow Communications maximised by stressing a "Great British quality" message in TV work from March to the end of the summer. Krow has always focused on DFS’s history, quality, British craftsmanship, 15-year guarantees and handmade-to-order sofas, but has had a recent determination to improve advertising likeability – and founder John Quarrey reports that "our main Team GB commercial was one of the best-liked ads we’ve ever researched". New DFS chief marketing officer Toni Wood credits the success to creative strategy, aligned with well-planned channel mix and media econometrics. She adds: "The recent work has really moved DFS forward, as a brand and in the way people see us, and we will continue with the Aardman partnership we launched at Christmas to tell the stories of our own people, in their own voices." Other noteworthy brands are Philadelphia, which, in 11th place on a TV budget of less than £6m, boasts the best-value TV advertising of the year; and BT, which, at joint 14th with a TV budget of almost £58m, has the worst. Oak Furniture Land, in fifth, deserves a mention for making a small budget go a long way. As does Tesco, whose Ruth Jones and Ben Miller campaign was dismissed by the industry but came sixth in "Best-recalled brands" and joint fourth in "Most memorable individual ads". Grey planning partner Fiona Keyte is not surprised that McVitie’s kittens are Adwatch’s most engaging vehicle of the year. The "Sweeet" campaign, which won an IPA Effectiveness Award, is "designed to evoke the same feeling as the biscuits – warm, nurturing, a bit indulgent, a ‘chocolatey snuggle’. We use neuroscience to test every ad and our research showed the ‘Students’ commercial really cut through because of its very relatable backstory." Morag Blazey, managing principal of market intelligence at Ebiquity, which sources the annual budget figures, finds the likeability results interesting: "What binds the diverse advertisers is the use of animals, brand mascots and celebrities. "But whereas you really can’t go wrong with cuddly animals, selecting a celebrity is fraught with danger. We have recently developed a process of linking advertising weight with social media buzz, enabling us to identify how a campaign is resonating with consumers and whether the celeb is playing a positive role. "In some campaigns (Comparethemarket.com’s with Macaulay Culkin, for example), the celeb has driven buzz, commentary and peer-to-peer sharing… but we have also seen work where the celebrity has not moved the needle." Social media buzz inspired the year’s best-recalled ad, "Epic squads". Sophie Spence, strategy director at Mother, explains: "When we introduced Colin the builder last year, there was an immediate rivalry between him and Dave the strutter, with huge online banter between Colin fans and Dave fans. That was our starting point for the pair’s ‘car-park dance-off’ but, as the buzz continued to build, we created the ‘Epic squads’ film, which scored unprecedented engagement figures in our own Millward Brown tracking." In a category where topline ad awareness is generally falling as the sector matures, Spence says Moneysupermarket.com is enjoying rising awareness and brand consideration as well as a big uplift in site traffic, millions of Facebook views, thousands of social impressions and lots of media engagement with the campaign. And while the meerkats were among the ten best-recalled TV brands, the "Most memorable individual ads" list shows that Dave and Colin achieved early cut-through and created a social buzz, which Mother developed into even greater success. Amid Brexit uncertainty, it is an example that canny marketers keen to maximise every marketing pound might bear in mind.